A Moscow journalist's Facebook post has motivated the public to secure a Charles Aznavour concert ticket for a 73-year-old fan. The singer himself, moved by the story, wants to meet his Russian admirer. 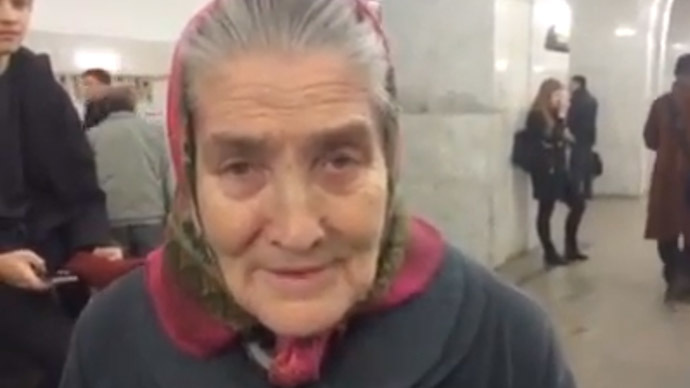 Journalist Aleksandr Chernykh met Lydia Ivanovna in the subway, where the elderly woman was standing at a newspaper vending machine looking at a magazine with the photo of the French-Armenian tenor Charles Aznavour. She was referring to the event at Moscow's Crocus City Hall on April 22, with tickets costing up to $600 - a steep sum for a Russian pensioner. But now, thanks to the power of social media, Russian ‘Granny Lida’ can go to the concert and meet her idol in person. As they talked, Chernykh discovered that Lidia has a fan of French singers since early childhood. She loves to sing along with them, and proved it by singing a few songs. He recorded a short video of her rendition an Édith Piaf song, which he said was "even more heart-piercing" than the original. To the journalist's surprise, Lydia didn't actually speak French. "I don't know it at all," he quotes her as saying. "I just like singing. You know, back in the 1960s, they had special cabins in libraries where you could come to listen to vinyl disks and memorize songs. It was very popular, we all went there." In the end, the journalist asked her for her phone number. "She said she didn't have one, but she wrote down mine. I hope she phones me and I can take her to that concert," his post says. Chernykh then asked his followers to help him find the granny. In a moving collective effort, the comment section was flooded by sympathetic followers, offering to locate her and buy her a concert ticket. Less than a day later, Chernykh updated his post, saying Lydia had been discovered thanks to one of the followers, who recognized her as his parents’ neighbor. What’s more, he was contacted by Aznavour’s representatives, who said they were happy to provide a free ticket for Lydia, and the singer himself wished to meet her in person after the concert for a chat and a photograph. Aznavour, 90, has written over 1,200 songs and sold more than 180 million records. He is of Armenian descent, and has taken part in social activism and politics in both France and Armenia. The problem now, though, is that Lydia is too shy to meet him in person. "I've never been to his concerts, what shall I do there? I just like to sing and listen to songs," she says.